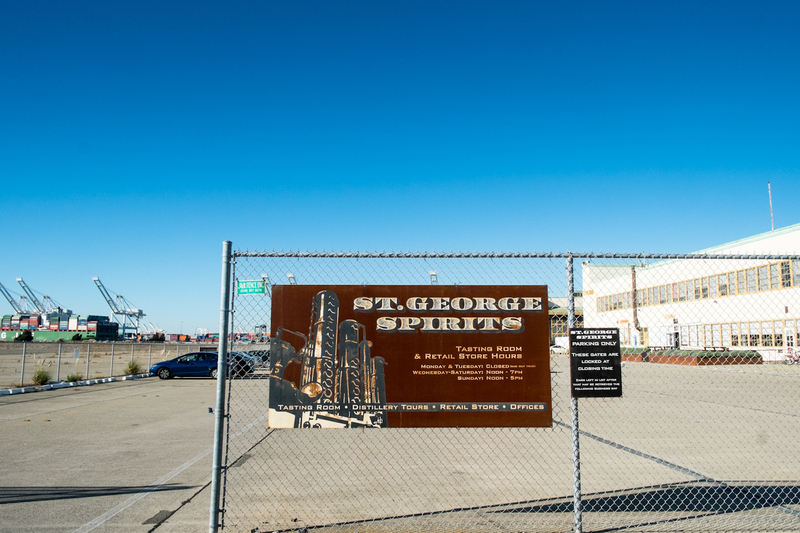 St. George Spirits occupies a large airplane hangar on a former naval base in Alameda, California. 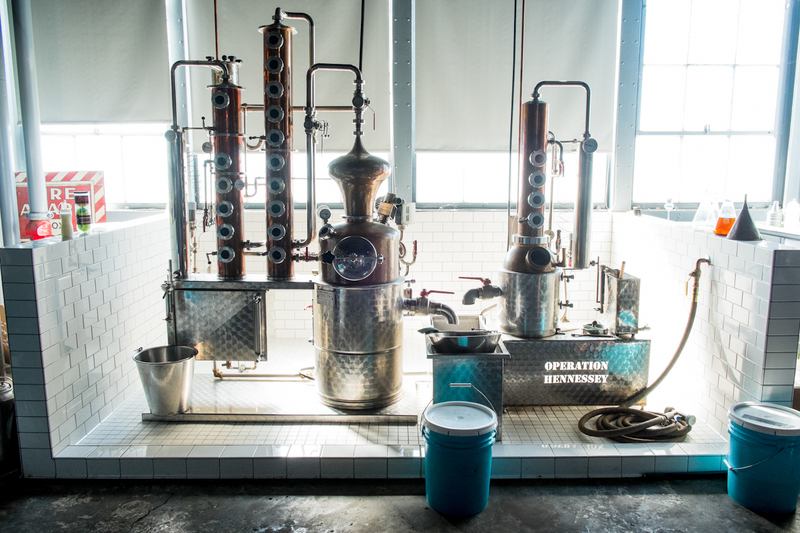 It is the oldest craft distillery in the United States and one of the most experimental. 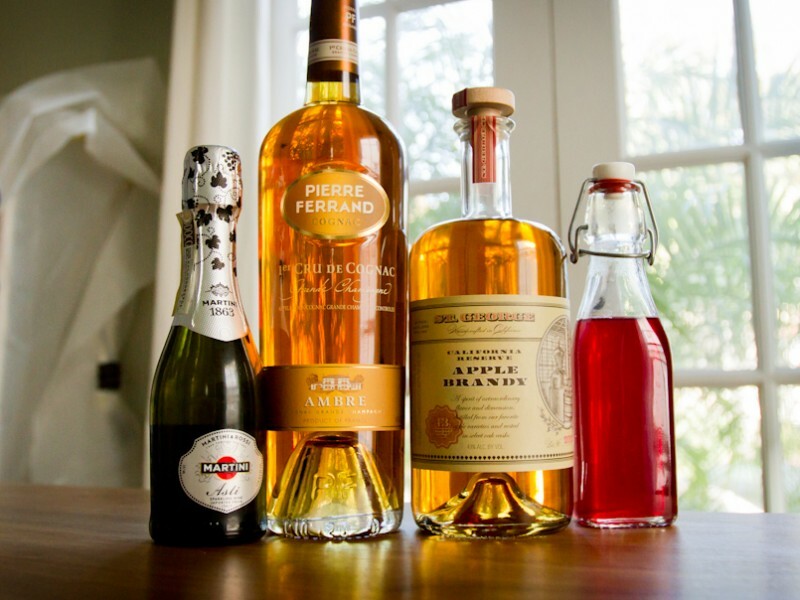 To get an idea of its range of expression, one only need to take inventory of our collective liquor cabinet at the Rituals—all three gin variations (Terroir, Botanivore, and Dry Rye), green chile vodka, rum agricole, pear brandy, apple brandy, raspberry liqueur, absinthe, and their NOLA Coffee Liqueur count among our faves. 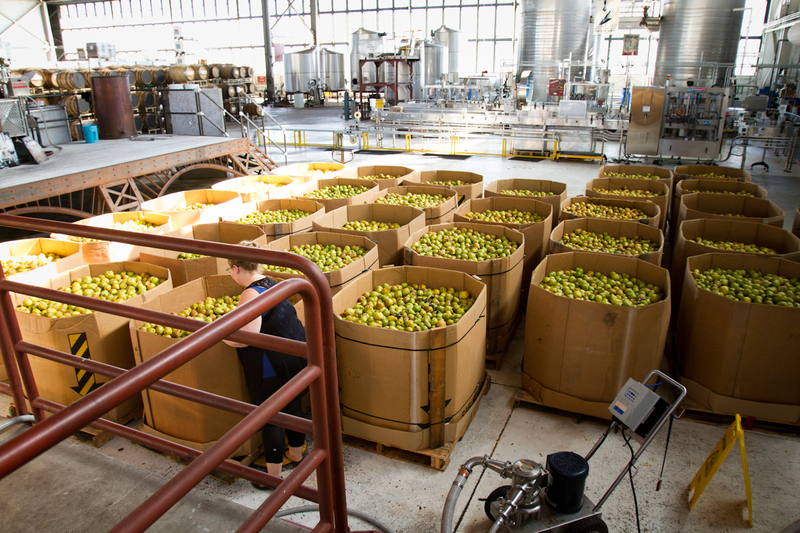 We traveled to the Bay Area to pay a visit and were immediately confronted by 20 tons of dry-farmed organic Bartlett pears from Colorado, waiting patiently to be crushed and fermented with champagne yeast and distilled into St. George’s flagship spirit, their delicious pear brandy. 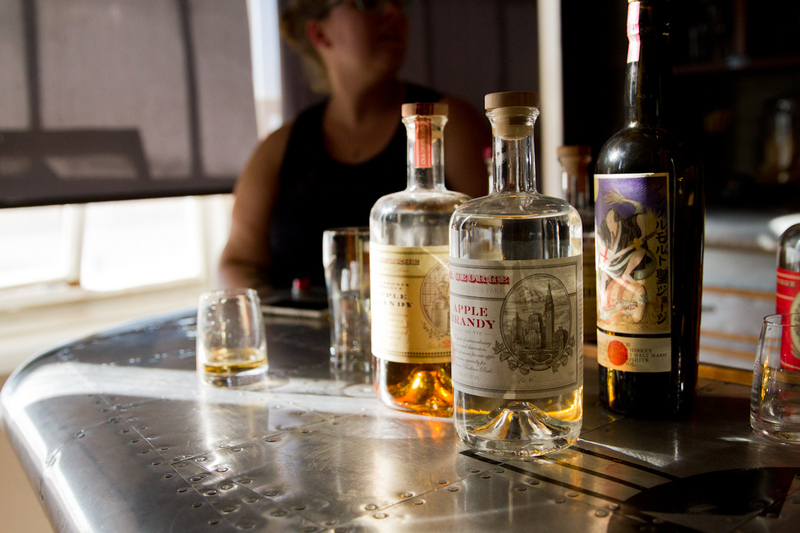 Although most of the glory in craft spirits goes to the master distillers (in this case Lance Winters), we thought it might be interesting to learn more about those who toil in the background without recognition. We spoke with one of these unsung heroes—St. 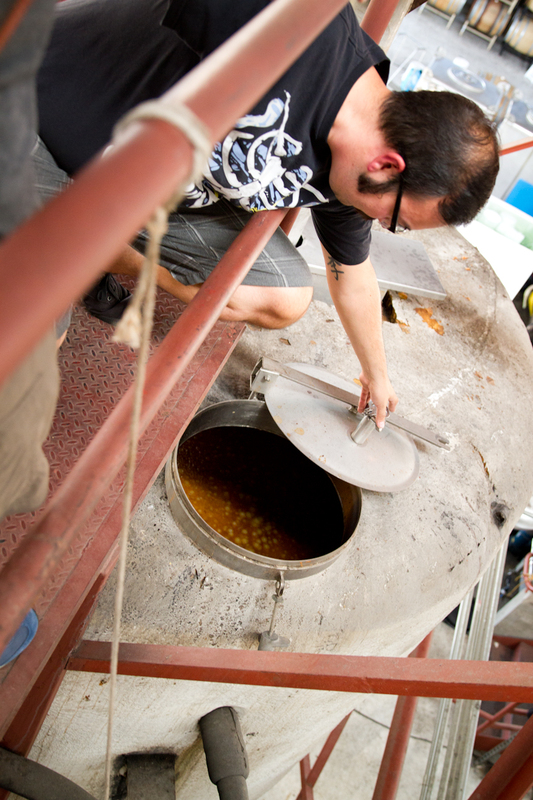 George Spirits’ apprentice distiller James Lee—about what it’s like working in the trenches. 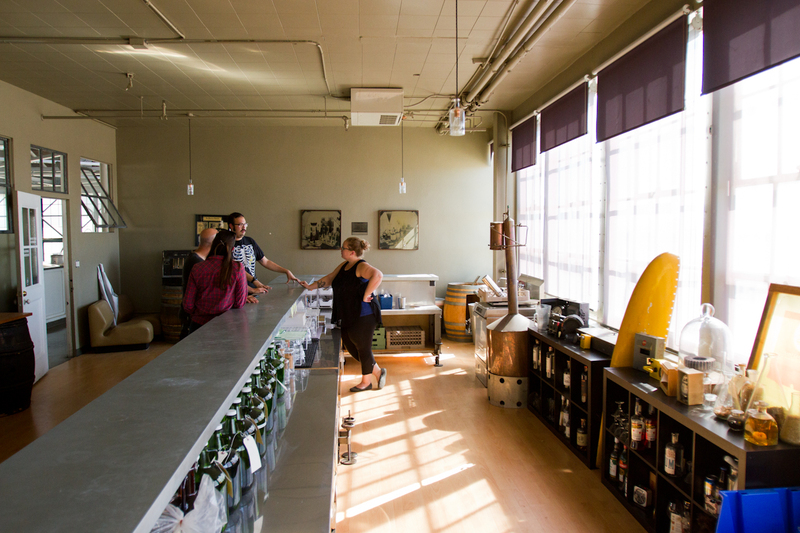 Full disclosure: Mr. Lee and office “minion” (yes, that’s her official title) Katie Cavenee gave us a three-hour tour of St. George Spirits and let us sample some of the greatest hits from their personal spirits collections. 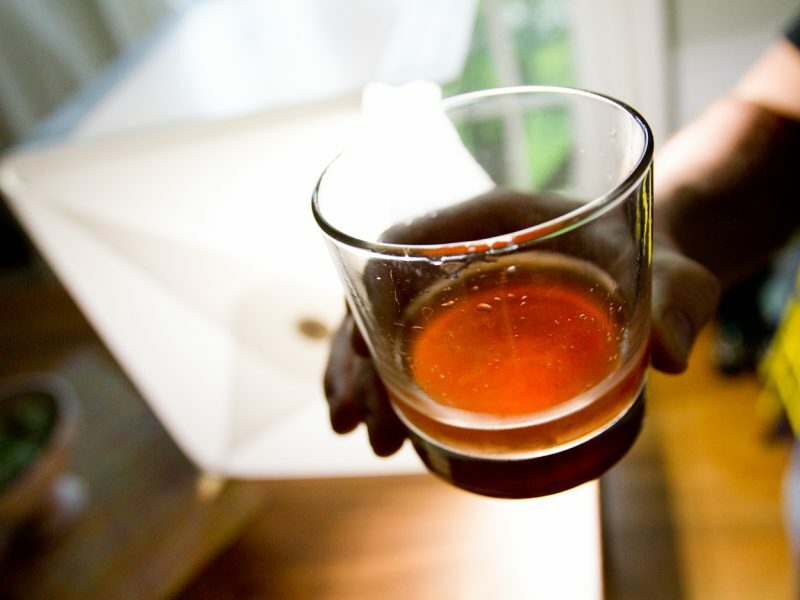 The Rituals: You started homebrewing in college, right? So how did you get interested in spirits? 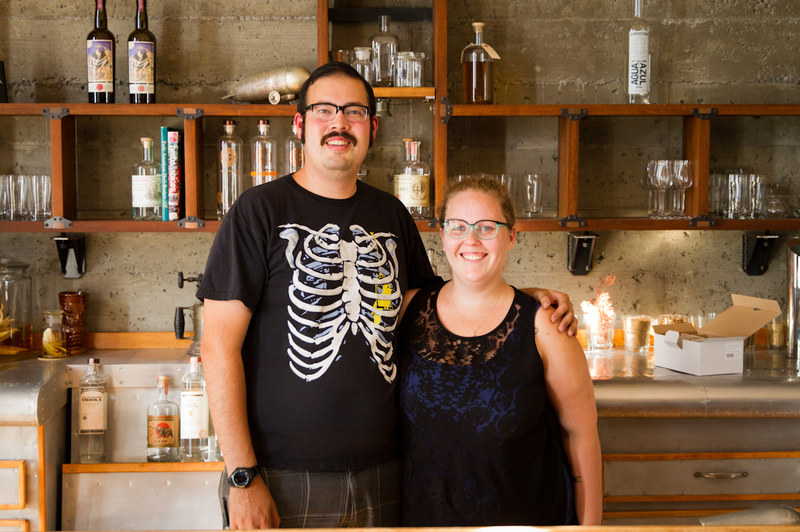 James Lee: My friend Chris [Jordan] and I went to a bar in Santa Cruz called 515 that carried some St. George products that we no longer make: the Qi liqueurs, which were tea liqueurs. There’s a Qi White which was white tea and honey and then Qi Black which was lapsang souchong tea and brandy, with a little bit of honey and orange. At that time I was 21 or 22, drinking Irish car bombs and adios motherfuckers and all those terrible drinks that you drink in college, so this was my first introduction to spirits in a broader sense. The bartender told us about St. George Spirits and we looked them up on the Internet and discovered they did tours and tastings so we decided to check them out. We thought it was amazing and we kept going back, taking other friends with us. That was in 2007, probably right before they released the absinthe [the first legal absinthe in the U.S. for 95 years]. The Rituals: How did you start working for St. George? James Lee: Chris graduated and moved back to the Bay Area and got a job in the tasting room at St. George in 2009. 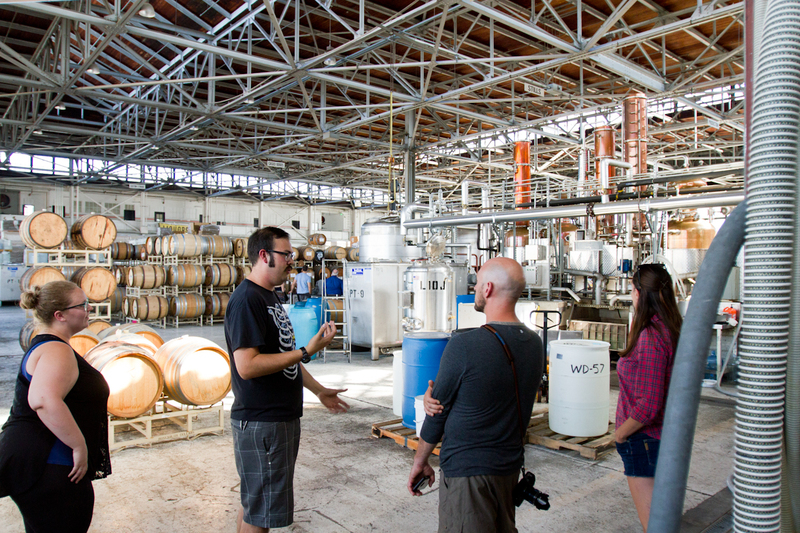 I was still in Santa Cruz but any time there was anything fun going on he would always invite me to the distillery. So I got to know everyone who worked there and when I moved back in 2010 they basically just asked me if I wanted to work in the tasting room. 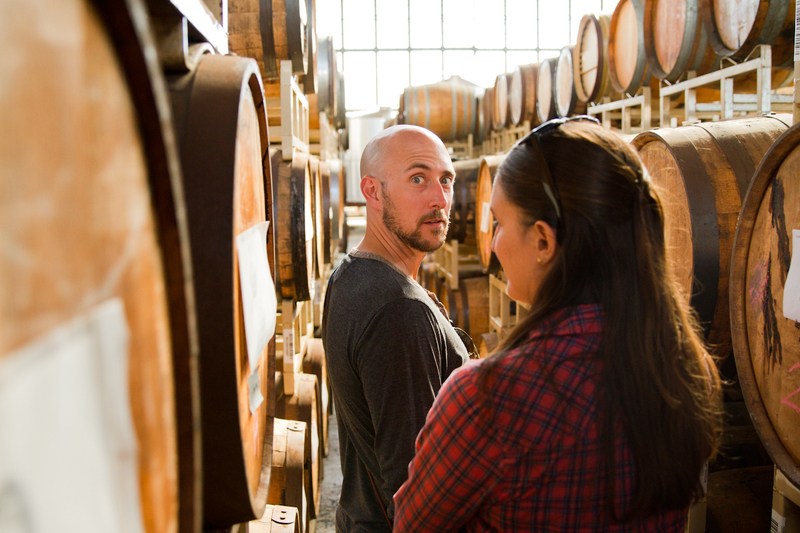 So I poured tastings, gave tours, and worked events, and when Chris eventually transitioned from the tasting room position to production, I would go out and talk to him and figure out what was going on out there. My boss noticed that I was out there way more than in the tasting room so in 2012 they offered me a production apprentice job and that’s what I have been doing ever since. The Rituals: Can you break down what St. George is like, personnel wise? James Lee: In production there are three people on the floor doing the everyday work: myself as the production apprentice, Chris (who used to be a production apprentice and now is the assistant distiller), and our coworker Brad [Joyce] who started as our intern but has become a full-time employee basically as a cellar rat. Above us our direct supervisor is Dave Smith, who is vice president of St. George Spirits—I think Blender and Distiller is his official title. And above him is Lance [Winters], the owner and master distiller. Chris, Brad, and I are doing all of the everyday work distilling. 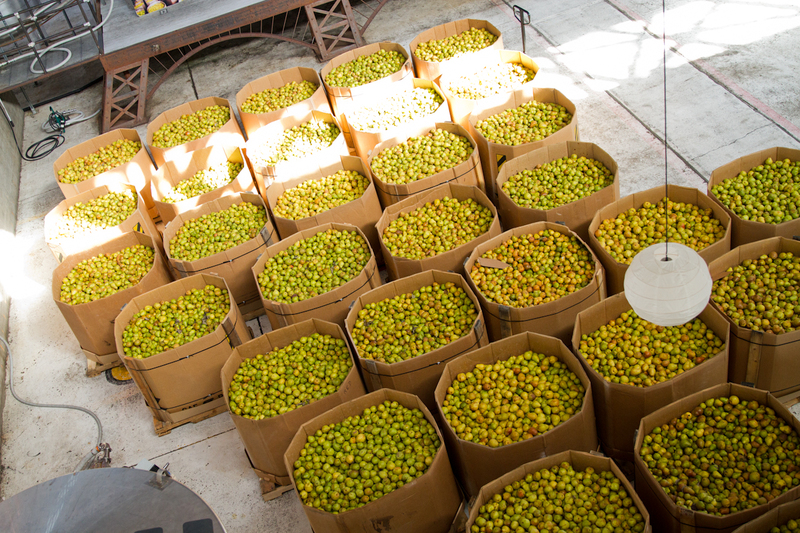 We basically start on the fermentation side and go all the way until the product is ready to be bottled. So proofing, distillation, barrel aging, blending, stuff like that. Everyone wears a lot of hats so if someone is sick you’re helping load trucks and build orders. If we need help cleaning tanks, the warehouse guys will help us. The Rituals: What’s an average day like? James Lee: I get in at 9:00. 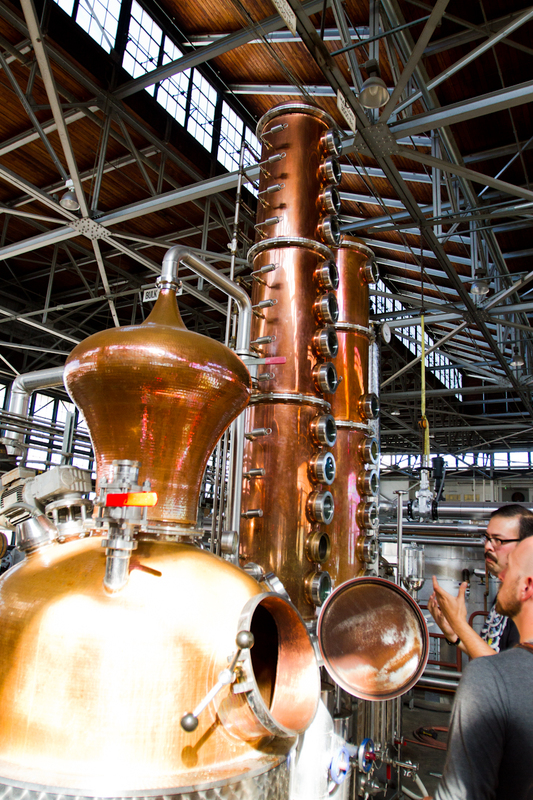 If the stills aren’t already fired up I turn on the boiler and get the pots filled with whatever we are working on. Right now we are working through some Sierra Nevada Celebration Ale that we’re turning into some whiskey. 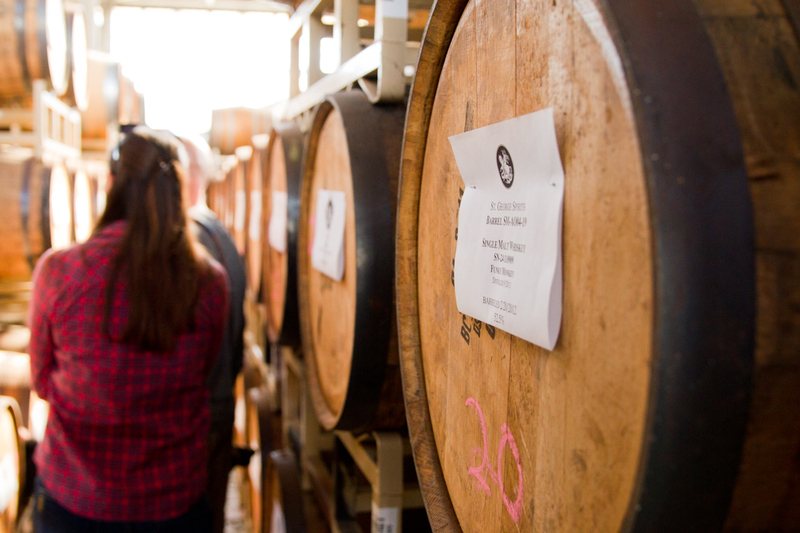 Once that’s going, there are other projects we’re working on, usually getting something ready for bottling or something we just distilled needs to go down to barrel so we need to proof it down a little bit—make sure it’s the right barrel proof—then get that into barrels. Making sure everything is labeled. And then a lot of cleaning. Usually there are three or four projects going on. 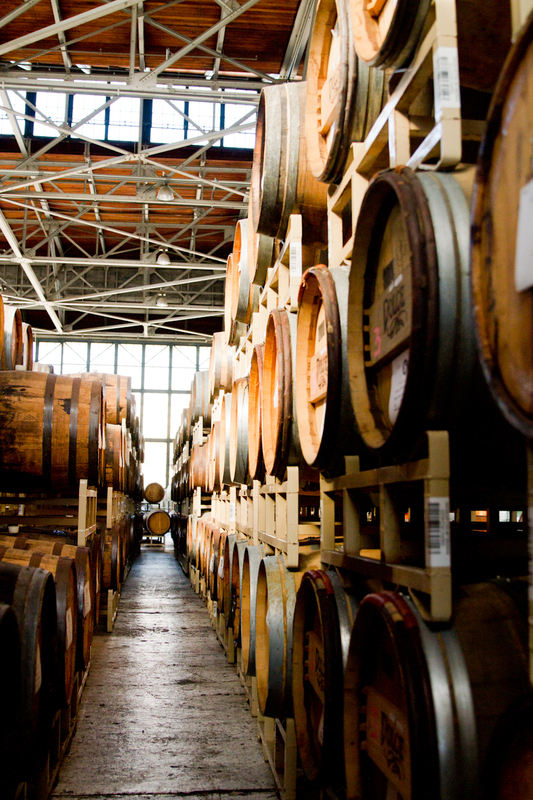 Last week we were reorganizing all of our barrels just for better functionality. We’re prepping botanicals for infusion next week. Yesterday Brad, Dave, and I drove up to Mendocino to load up a flatbed truck with Douglas fir from our source up there, drove back, and then today we ran it through a wood chipper, then infused it with GNS [grain neutral spirit] to start the process for making the Douglas fir distillate that we use for the Terroir gin. It’s pretty labor intensive but it’s a lot of fun. Actually, the scale of it blows my mind sometimes. 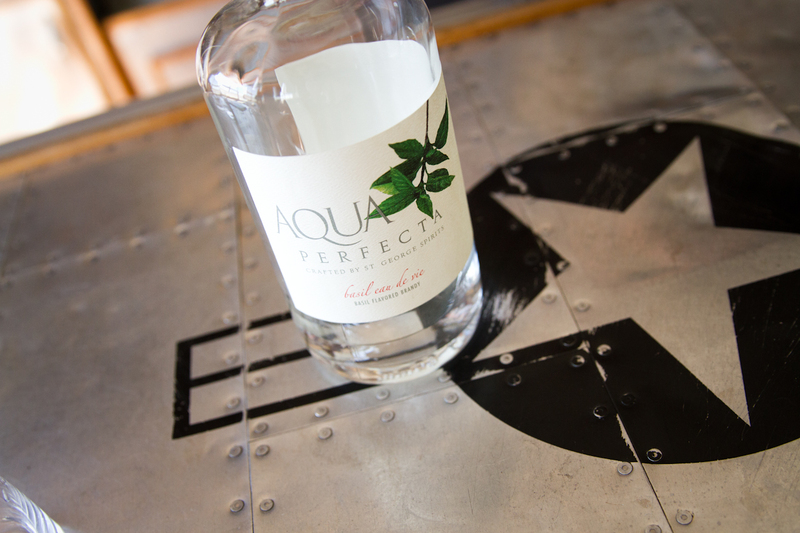 Who else gets to handle a 10,000 gallon batch of vodka? 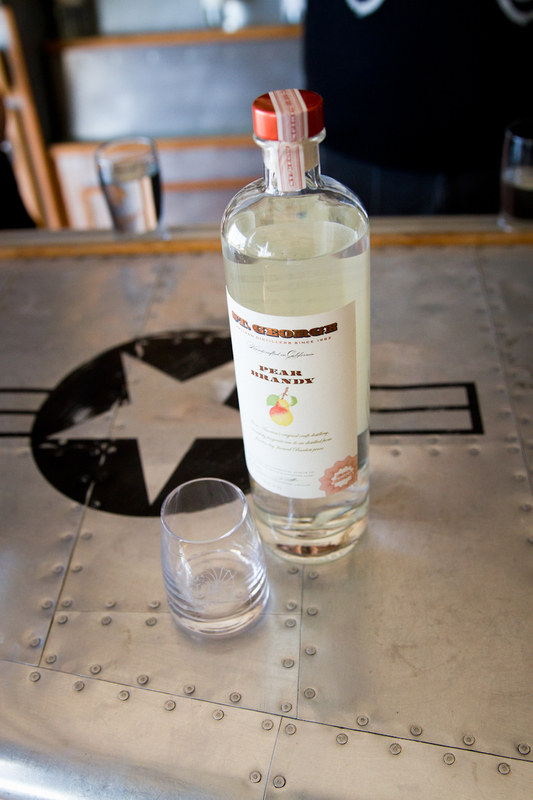 The most vodka a person usually sees at one time is a handle [1.75L]. It’s mind-boggling. “The scale of it blows my mind sometimes. The Rituals: Do you have any creative input? James Lee: We’re really busy right now, but if anyone wants to experiment and try something and put in the time, then Lance and Dave will help them get a project off the ground. 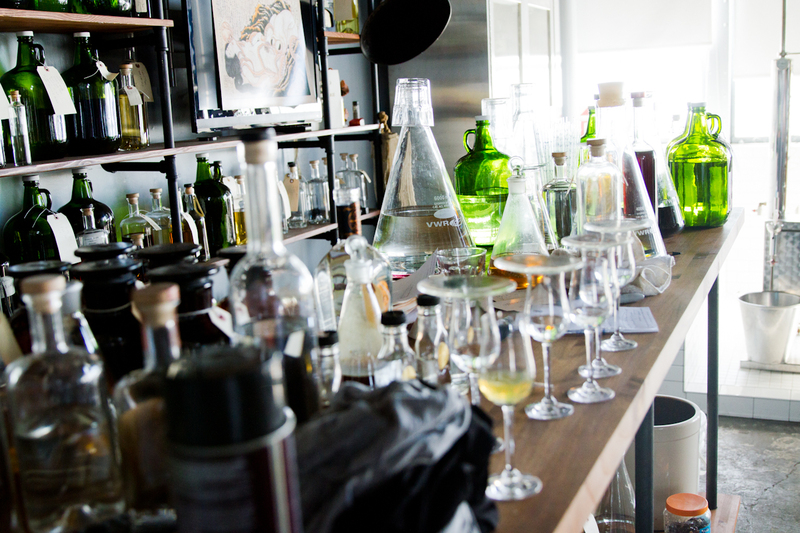 I remember bringing in ten buckets of persimmon that I wanted to ferment and distill because I had never seen a persimmon brandy—and they gave me time on lab stills and helped me out. It’s funny because I was talking with Jörg [Rupf, the founder] one day when he was visiting and he said, “Oh yeah, I did persimmon brandy once. It wasn’t very good.” But he still encouraged me to try and make something better than he did. Everyone is open to ideas and experimentation and trying things. We always say, “There is the right way, the wrong way, and the St. George way.” We’ll usually do something at least three times and fail at it before we figure out how to get it right. These days, though, we’re so busy working on the day-to-day stuff we don’t get a lot of time to play around. The Rituals: Has your palate changed since you’ve been working here? James Lee: I definitely can distinguish more flavors now. I used to be like, “Oh, this tastes like whiskey,” and I thought people who had tasting notes like chocolate and burnt almond and leather and cigars were kind of ridiculous—but over time you learn. Sometimes you get weird flavors in whiskey. There’s this strawberry candy note—like the Brach’s hard candy strawberries that you get in the grocery store—that comes through a lot. We’ve developed a language amongst ourselves at the distillery so that we can communicate with each other in a way that’s not so esoteric. 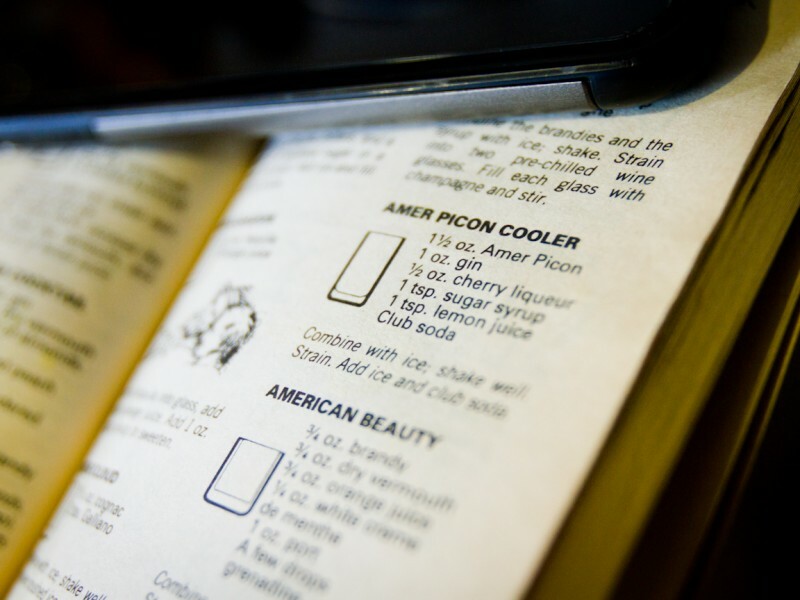 The Rituals: Do you have any distilling ambition yourself? 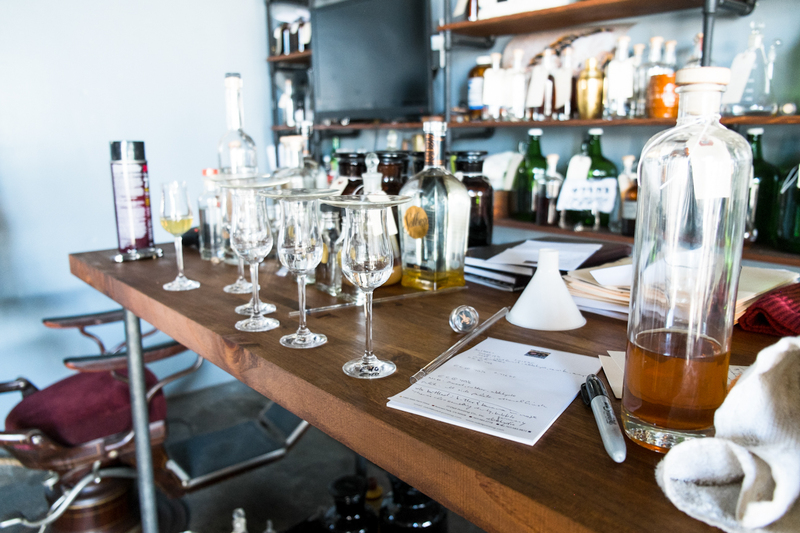 James Lee: There are lot of people who think because they distill at home [Editor’s note: It is illegal to distill spirits of any kind without a license in all 50 states] that they can run a distillery—the same way that home brewers sometimes think, “My beer is delicious; I can open a brewery!” But it’s not as easy as just making a good product. There is a lot of more that goes into it. 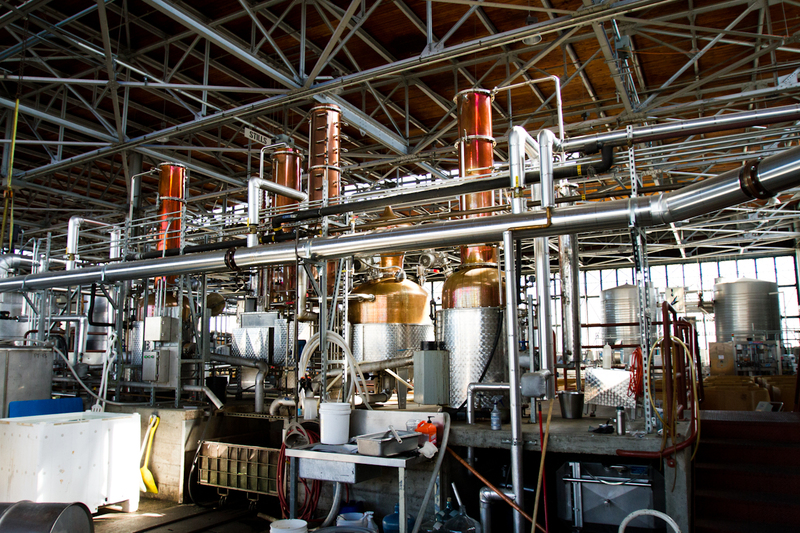 When I first started at St. George and got into distilling it sounded like a cool idea, but I’ve seen all of the work and the money that goes into starting a distillery, and the laws—especially in California—are slightly discouraging. It’s like opening a restaurant—one of those things you throw a lot of money at and hope to break even. 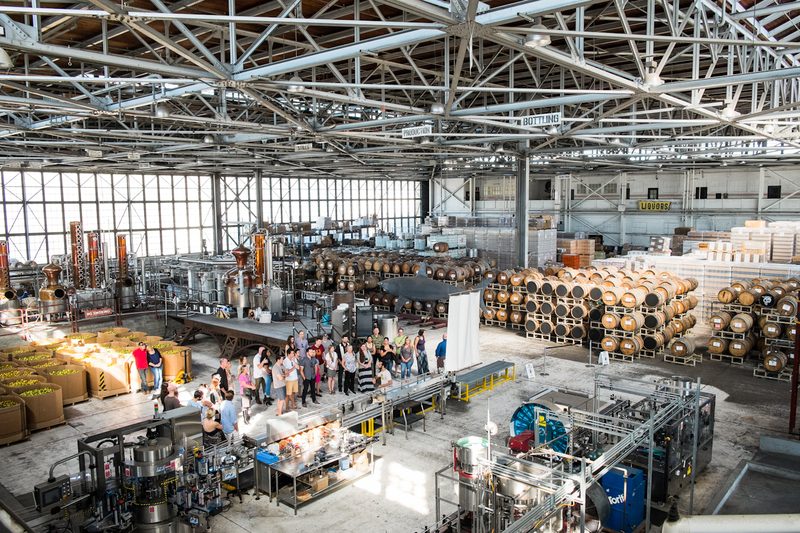 We’re very fortunate that we are doing so well here, because I know in Portland (where the laws are much more favorable towards distilleries) they had a huge boom of distilleries opening, but more than half of those have closed already. The Rituals: Any advice for people trying to get into this industry? James Lee: It’s a weird industry to get into. There are not a lot of easy direct paths to it. Everyone at St. George has different background. Chris was a biology major, Dave majored in English, and Lance was a nuclear engineer in the Navy before he was a brewer. I don’t even have a degree. So we come from all over. We like to refer to ourselves as the Island of Misfit Toys. 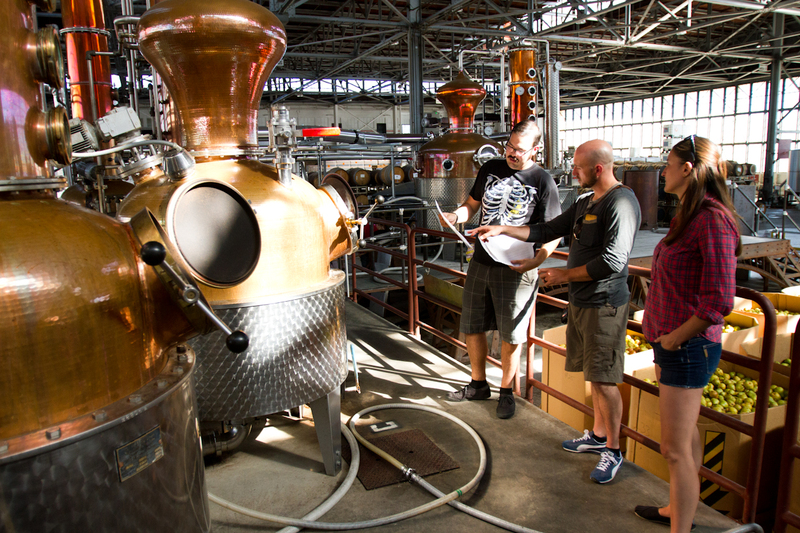 If you want to learn about distillation, definitely talk to people, go to distilleries, show that you’re interested. 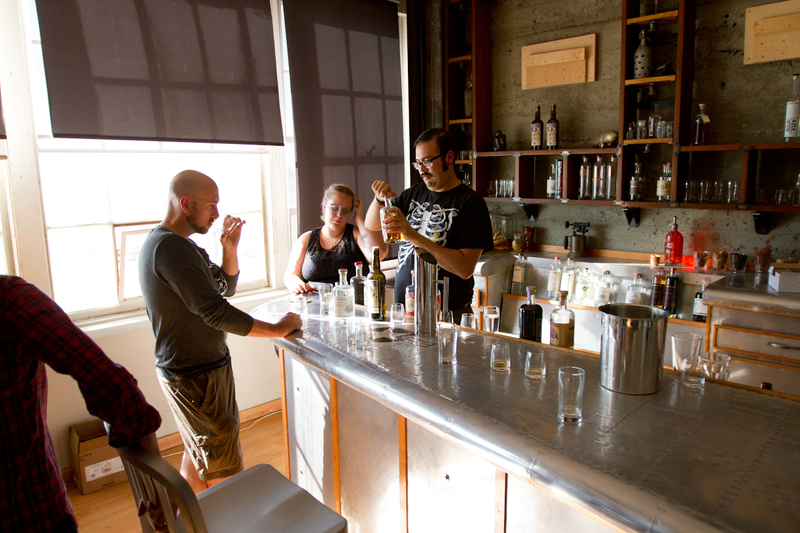 One way is to start in another part of the beer and wine industry to gain knowledge. Any kind of biology or chemistry background is definitely helpful. If it’s really what you want to do you will find a way to make it happen. I would have never thought I would be a distiller but it’s super fun. I love it. The Rituals: Okay then, what’s your least favorite aspect of this job? James Lee: Cleaning tanks! It’s pretty hard work. But it’s also rewarding because you can see the physical result of your work when you get inside and power wash a really dirty tank. 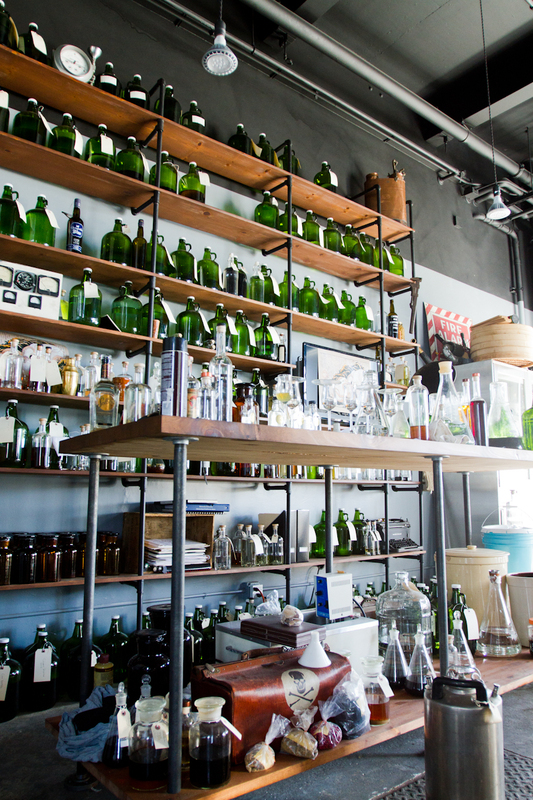 Although we don’t have to worry about sanitation and infection to the degree that a brewery has to, we definitely have to worry about cross contamination of flavors, especially with absinthe or funky beer. The Rituals: How about your favorite aspect? James Lee: One of my favorite parts is just knowing that I had a hand in seeing these things to fruition. This physical object here that I can put on a table—I helped make this. That’s super awesome. I’m excited to be here for a long time and know that in the next few years there will be whiskey that I have distilled in the blend. I love whiskey. It’s crazy to think about it—you know, you start with the grain, then you taste the beer, and then you taste the white dog. And then you taste it every year to see how it’s changing. And finally one day it goes into a bottle. The Rituals: It’s like having a kid, right? If your kid went into a bottle and you drank it. On the next Rituals: Brian and Eric star in their own four-act play.